Cheques or postal orders can be made out to: Sherkin Island Marine Station and sent to the address above. You can also pay by Paypal. Even if you do not have a Paypal account, Paypal will still accept credit card payments. Email us your order and we will email you back a Paypal payment request. When the Marine Station was established at Sherkin Island in 1975 a lichen survey was undertaken as one of the range of studies that were carried out by its volunteer biologists in that year. Prior to that, the only records of lichens from the island were from a herbarium collection and a few field observations made by the Cork-based lichenologist Lilian Porter when she was active in the area in the 1930s. Two further datasets for lichens were produced by biologists working at the Marine Station in 1986 and in 1999. 1986 also saw the creation of a lichen collection which was incorporated into the Marine Station's plant herbarium. 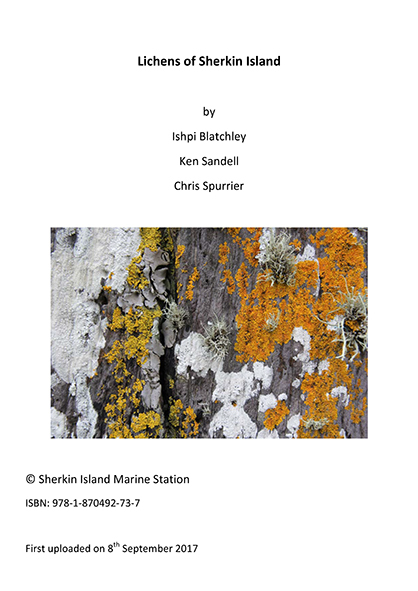 A field visit to the island by the present authors was made in August 2016 to further enhance the lichen information for Sherkin and contribute some more recent records. As far as we are aware there are no published accounts of the island's lichens in the scientific literature apart from one brief mention so this report aims to address the issue by drawing together all existing data.